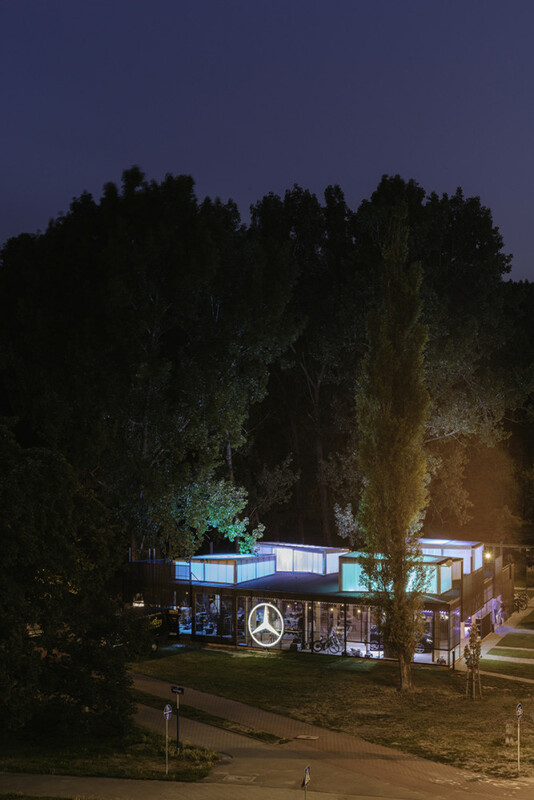 The architectural expression of the Mercedes-Benz pavilion combines inspirations find in a design of the Poniatowski Bridge in Warsaw, industrial car workshop and an experimental approach to re-cycling and re-shaping of a temporary structures. 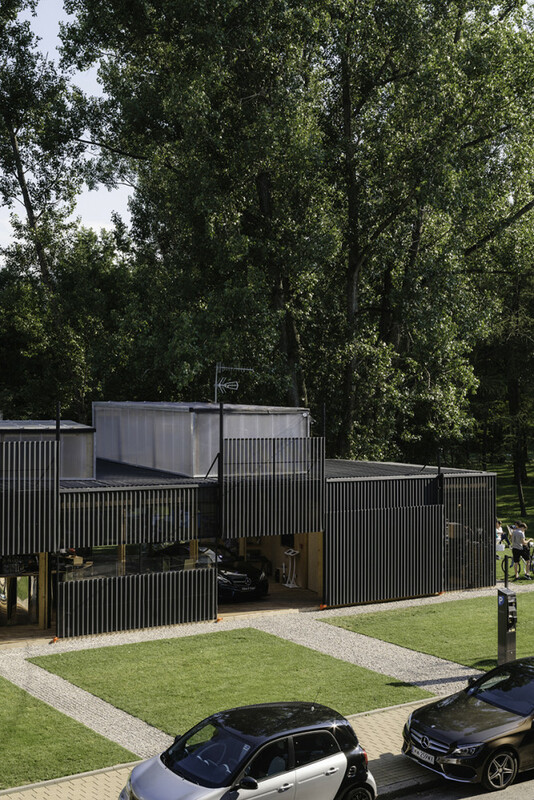 Light wooden structure used in previous editions of the Mercedes Benz Pavilion has been totally reconfigurated and reused. 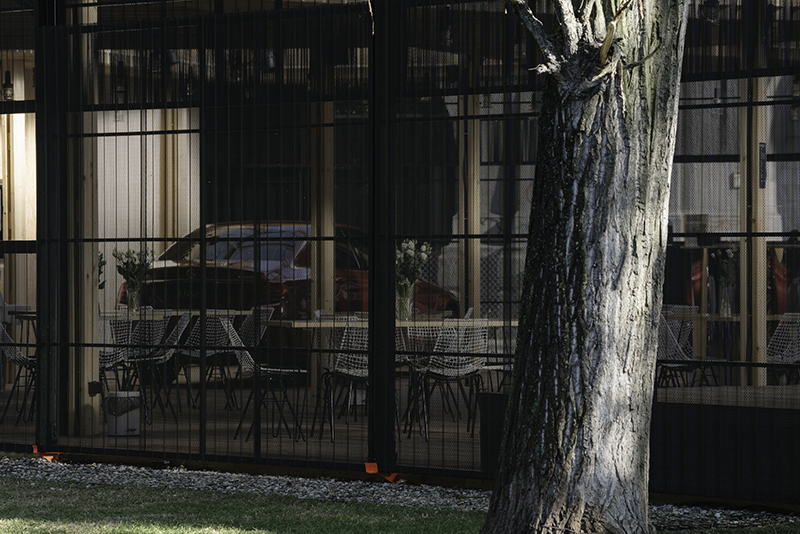 The main element that defines the architectural expression of the pavilion is a new version of its semi-transparent facade, which was made of a set of perforated metal sheet. 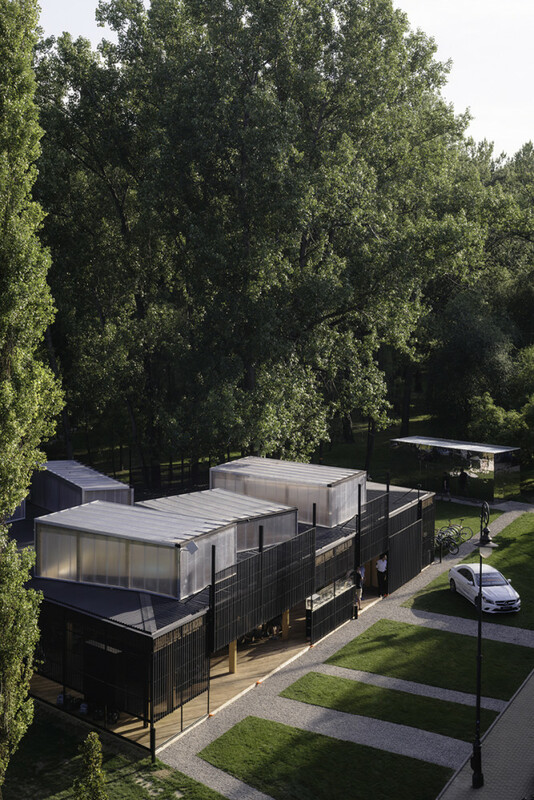 Some of the façade modules are equipped with a system of hydraulic jacks allow for any of lowering and raising. 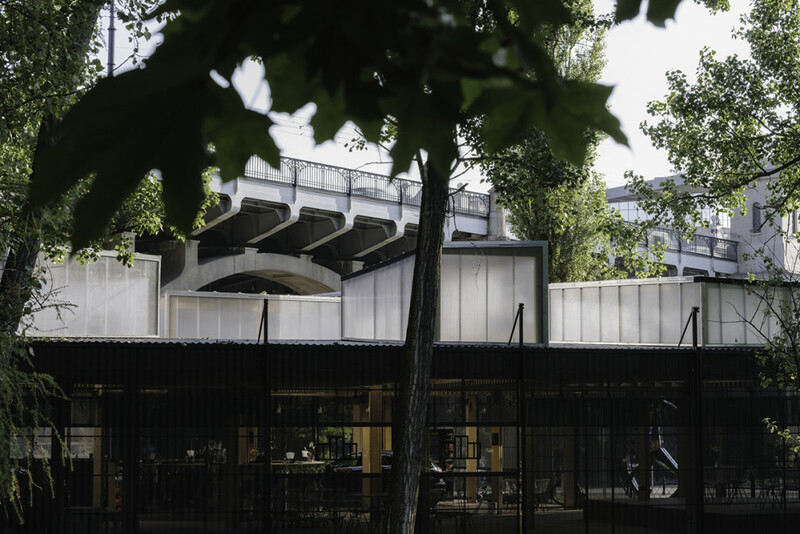 In this way, the pavilion gained two regimes of action: open form with a raised façade, creating the impression of the pavilion floating above the ground; and second regime, with lowered facade signalising the closing hours of the pavilion. 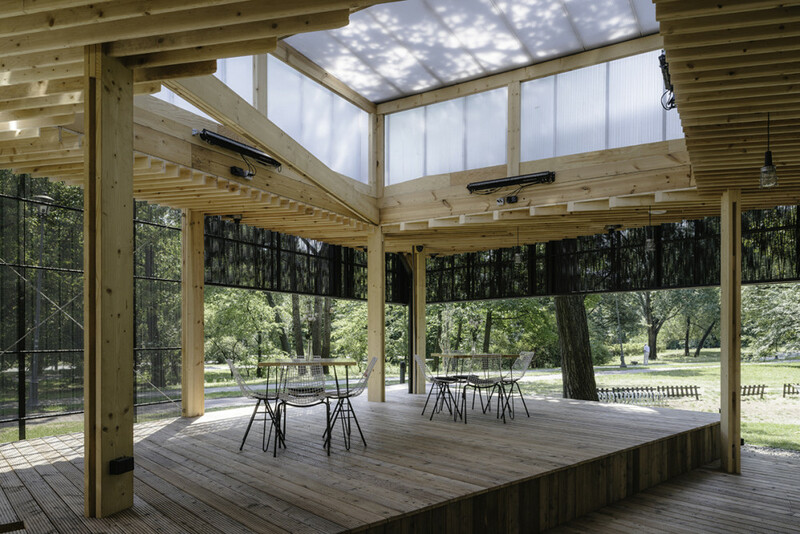 Wooden beams were used to build open-space interior of the pavilion. A circular, mirrored bar has become a central element of the whole interior. Western and eastern corner of the pavilion was used as an exhibition space for two cars, while the south side of the pavilion was earmarked for multi-function terrace, with views of the vast park landscape stretching in the immediate vicinity of the pavilion. An important element of architectural design is set of skylights placed on the roof of the pavilion. During the day they provide natural sun light to the interior of the building and at night, illuminated with multicolored lights, they create a clear artistic accent, which distinctive pavilion from it’s environment. In the immediate vicinity of the main pavilion a small technical pavilion housing a sanitary facilities and warehouses was erected. Its facade is clad with polished steel sheets, which reflects the surrounding landscape converting it into an abstract composition. 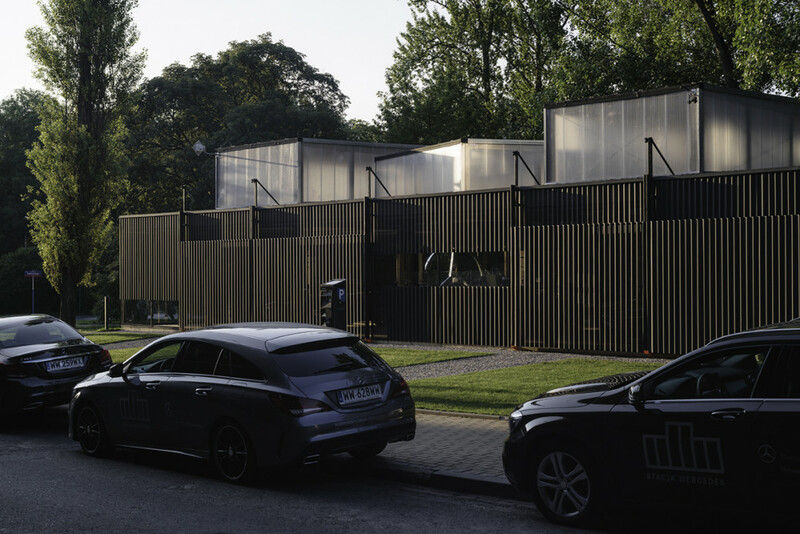 Mercedes Benz Pavilion operates from 2013 as an temporary pavilion, which in the summer months performs the functions of urban showroom, cafeteria and places of concerts, exhibitions, discussions and meetings. 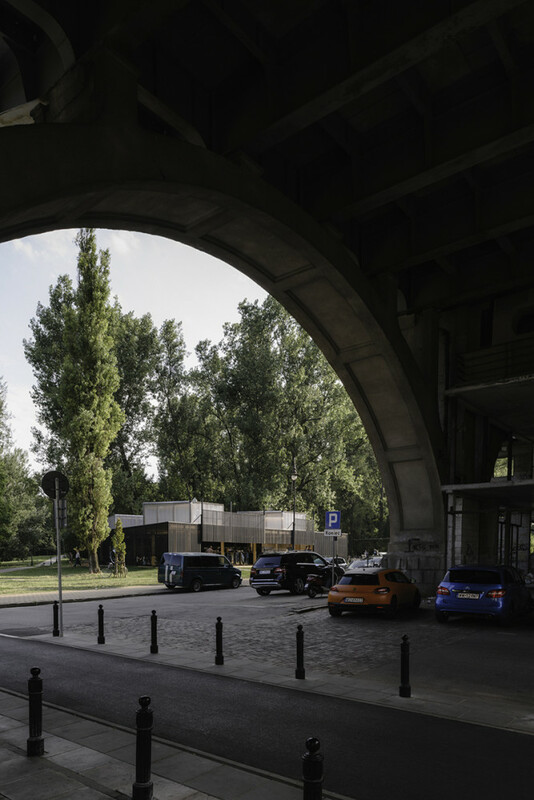 The station is located near the Vistula river in Warsaw inside the eighteenth century foundation of Nad Książęcem Park, founded by Prince Kazimierz Poniatowski, which stretches along the Warsaw Escarpment.